With respect to the abortion issue he is perhaps best known for popularizing the idea that Dr. Seuss’s 1954 children’s book “Horton hears a Who!” was really a God-inspired prophetic book about abortion (! ), even though it was really and demonstrably about the American post-WWII occupation of Japan (but that is just what such irrelevant talking heads as the author would claim – as opposed to Engle Dr. Seuss never maintained a prophetic hotlink to, well, Engle himself, I suppose). The radical silliness of it ensured that the book made this list. To emphasize: Engle doesn’t think that the book supports his argument, but that it is actually the word of God channeled through dr. Seuss. According to Engle the Trayvon Martin case is apparently supposed to have something to do with abortion as well. In 2010 Engle traveled to Uganda and organized a The Call rally there, praising the Ugandan government's efforts to combat homosexuality (including the Ugandan anti-homosexuality bill that, at least in practice, called for the death penalty for gays and lesbians in Uganda). He later, rather sheepishly, claimed that he opposes the bill and violence against homosexuals, but it is a little hard to believe him (there is an interesting review here). He has, after all, claimed that gay rights and secular government are similar to Nazism. As he says: “Can a homosexual have civil rights in America? They might. But it is not their right given by God. Their right is to repent and stand until Jesus delivers […] Brothers and sisters, we made it two spheres: government has a sphere and God has a sphere. That’s what they did in Hitler’s day, they voted for money in economic crisis and they sacrificed the sanctity of life of the Jews. We do the same thing in America.” Yes, take that, sanity! Ex-gays, on the other hand, can heal AIDS. Engle has seen heard dreamt it. For the rather infamous The Call: Detroit (2011) the plan was to convert Muslims and ‘free’ gays from homosexuality (it is discussed here). For the rally he gathered quite a few luminaries, including Rick Joyner, Jerry Boykin, and Kirk Clement, who claimed that God had told him that the event would convert millions of Muslims to Christianity. Engle’s co-host, however, was David E. Taylor, who believes that he has been granted well over 1000 face-to-face visitation appearances from Jesus Christ personally, and that Jesus appointed him to be America’s Moses with the task of bringing forth the country’s “deliverance from murder (abortion), drugs, alcohol, homosexuality, lesbianism, gambling, murder/homicides, corruption, and wicked government” (later ostensibly confirmed by God’s appearance in a cloud in Canada – seriously). In advance of the rally Engle claims to have had a dream about two tornadoes destroying America. The fact that it didn’t happen he took to be evidence that his rally prevented them (and that governor Perry’s prayers ended the drought in Texas at that time). It is not the first time Engle has blamed natural disasters on political views he doesn’t like, nor the first time he has claimed to be able to prevent it by having the right political view. His co-organizers of the Detroit event claimed ignorance of Engle’s anti-Islamism, but things suggest that their claims were not entirely true. Engle’s and Joyner’s claim that Muslims were conspiring to overtake Michigan eventually made some headlines as well. In 2012 his The Call rally saved Texas from multiple tornado deaths. In other words, when tornados kill it is God sending a message to the effect that those who disagree with Engle is wrong; when they don’t it is also God sending a message, that Engle is right – in other words, the same message, which to others would have entailed that God’s messages were a little hard to read. But not to Engle (here he joins forces with other wingnuts to stop, by prayer, a “homosexual tornado” from coming to “destroy America”). He knows he is right, and no amount of evidence can disconfirm that. The success in Texas made him very optimistic for the subsequent tour in Virginia: “Virginia has always been a state that was instrumental in the great shifts of American history […] even during the Civil War, God began to pour out his spirit in the South in the soldiers in the Army camps of the South, the spirit of God was being poured out and we believe once again God will visit us in the days of great crisis.” Tactful. Here is Engle calling on the religious right to channel confederate generals in order to restraing the homosexual agenda. 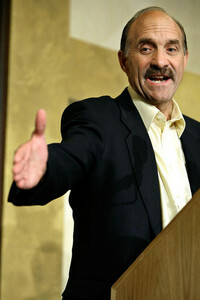 There is a comprehensive Lou Engle resource here. Here, by the way, is Engle’s “bipartisan” endorsement of Romney for president in 2012. Diagnosis: A bad person, and mad as a hatter to boot. Engle is an extremely influential, zealous enemy of sanity and reason, clearly (at least partially) to blame for many ills in society, and in fact one of the most dangerous and detrimental forces in the US today, no less. More on the apolitical international house of prayer.